Almost Gotch-ya: On-baller Xavier Gotch was a consistent presence in the midfield during South Adelaide's dour Qualifying Final struggle with Sturt. Image: Nick Hook Photography. 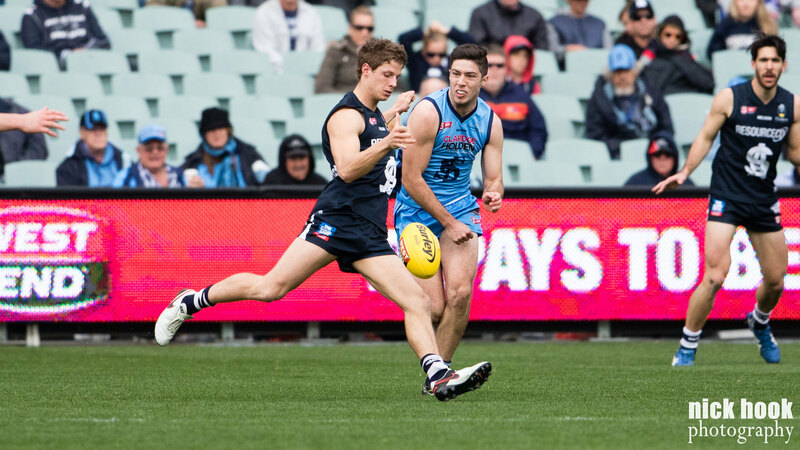 South Adelaide were unable to control a fourth-quarter surge from an impressive Sturt outfit during their Qualifying Final at Adelaide Oval, falling by 27 points to the Double Blues. After three quarters of physical footy, which saw numerous lead changes and the advantage to either side never grow beyond 13 points, Sturt took the lead for good on the back of a three-goals-in-five-minutes splurge that kick started a 6.3 to 2.3 final term. The shorthanded Panthers, who lost emerging utility Tyson Brown to a hamstring injury within the first five minutes of the game, could simply not match the rampaging Blues in the fourth and will now face Adelaide in a do-or-die Semi Final this Sunday. South looked to have the advantage in the opening minutes, with goals to tall forwards Brett Eddy and Sam Overall in the first 10 minutes having the Panthers looking at their high-scoring best. However, the goals quickly dried up for both teams in a match that was defined by it's physicality, with both teams combining for 190 tackles. The second quarter was another arm wrestle, with a goal soccered off of the line by Sturt's Scott McMahon just before the siren sounded for halftime giving his side a one-point lead at the major break. Again in the third quarter goals were hard to come by, with a soccered effort from South's Rigby Barnes and a second goal to dangerous Sturt forward Mark Evans the only major scores of the quarter. The game opened up for the Double Blues in the final quarter, as McMahon, danger man Kory Beard, classy midfielder James Battersby and new found X-factor forward Dylan Gamble put the game away. Best for the Panthers was vice-captain Matt Rose, who collected a game-high 26 possessions across the halfback line. The presence of veteran midfielders Xavier Gotch (27 touches, seven tackles and six clearances) and Joel Cross (24 disposals and seven clearances) provided much of the grunt work in the middle. Meanwhile, the defensive work of Richard Newell should not go unmentioned, who while not seeing much of the ball himself (nine touches), was stout in his manning of Sturt's dangerous ball winners and also slipped forward and snapped a brilliant goal with the game very much still in the balance during the second quarter. The efforts of Tom Fields (17 kicks, eight rebound 50s and seven inside 50s) and Nick Liddle (17 touches, 13 tackles and two score assists) were also evident. Thankfully the Panthers hold a second chance and will return to Adelaide Oval this Sunday for a Semi Final clash with the Adelaide Crows Reserves. It will be an elimination affair, with the winner to face the loser of Woodville-West Torrens and Sturt in the Preliminary Final the week after. All of the action gets underway at 12:10pm on Sunday 11 September. Stay tuned to the website throughout the week for more information about teams, tickets and other Finals news! Excitement Machine Engaged: Speedster Emmanuel Irra was the Panthers Reserves best performer in their Elimination Final loss to North Adelaide. Image: Nick Hook Photography. South Adelaide's Reserves season has come to an end after a 10-point loss to North Adelaide in their Elimination Final at City Mazda Stadium on Sunday. The Panthers were in the contest all afternoon and never trailed by more than 13 through the first three changes. However, North Adelaide were able to hold strong and defend their lead to the death and run out narrow victors. Most impressive for South Adelaide was exciting line-breaker Emmanuel Irra, who gathered 21 touches, laid nine tackles, won six clearances and handed out four score assists in a busy day at the office. Likewise, Joe Haines (20 disposals and nice tackles) and Nathan Daniel (20 possessions) also put their hand up for selection in the league teams' Semi Final against the Adelaide Crows this weekend. Speaking to SANFL Radio's Zac Milbank, Panthers CEO Neill Sharpe revealed Irra, Haines and Daniel were the three most likely players to be looked at as a replacement for Tyson Brown, who injured his hamstring against Sturt over the weekend. Also performing well against the Roosters were forwards Josh Trembath (16 touches, seven marks an four goals) and Pan Kokkinakis (18 disposals, nine marks, a goal and three score assists) and rugged defender Cam de Visser (19 touches, a game-high 11 marks and six rebound 50s).